Welcome to the M-RETS! Come in! Make yourself at home, but please take off your shoes. In this article we are going to look at an overview of the RECs tab. I will attempt to cover all of the basics you need to know to use the RECS tab. Your RECs view should look something like this. Please note, your tabs on the left may vary. M-RETS ID: The identification number of your generator. Fuel Type: Solar, Wind, Hydro, etc. RRC Adjusted Quantity: This is specific to the Wisconsin RRC program. Not sure what the Wisconsin RRC program is? Then this most likely can be ignored. 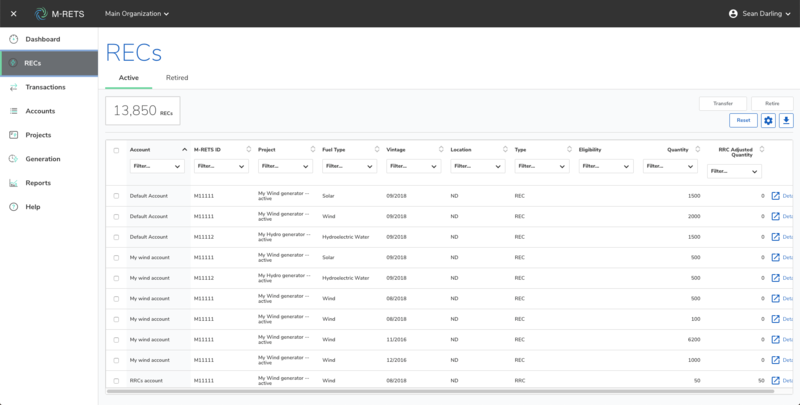 If you prefer a different layout of columns, then click on the header and drag it to a new location. You probably noticed the buttons labelled 'Filter...' near the top of the columns. This feature is for limiting what is shown in the column. Example: If I only wanted to see my solar RECs, I would click on the filter under 'Fuel Type' and select 'Solar'. Don't want to see all of these columns? No problem! Click on the gear icon. Un-check any columns that you do not want included in the table. Note: It will download everything that is currently displayed. This means any unchecked columns will not be included in the download. Congratulations! 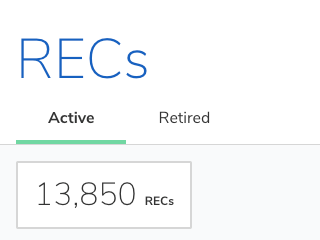 You just passed RECs tab 101!